All CCS Video Tutorials are .wmv files. Windows Media Player is needed for viewing. Subscribe to our YouTube channel (CCSIncTube) to stay updated on the latest videos. Use the EZApp library to quickly create a wireless sensor or controller on a PIC® MCU that may be viewed and displayed on a mobile device using Bluetooth® included in CCS IDE Compilers. 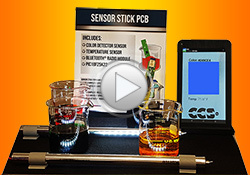 See a PCB stick in a chemistry beaker read the temperature and light. The EZApp library is used to display those results on a tablet! 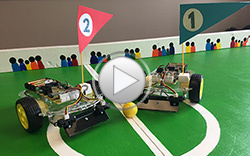 Two robot cars face off against each other on the soccer field. Players use the EZ App Lynx app to control the robot cars from their iPads. The robot cars are made out of sensors and a prototyping board. The robot arm is programmed to complete the Tower of Hanoi or can be in manual mode to be controlled from the tablet. The four colored blocks have pegs for the robot arm to grab and easily move the block. The tablet uses EZ App Lynx for displaying the robot arm controls. Drop a puck into the Plinko game and watch the line drawn on a tablet screen via Bluetooth®! The Plinko board has an array of light sensors between the pegs. When the puck passes over and blocks the light to the sensor, a command is sent to the PIC® microcontroller. The PIC® MCU talks to a Bluetooth® module to send the sensor coordinate to the application running on the tablet. As the coordinates are sent, a line is drawn showing the path of the the falling puck. Get started with the E3mini development board and troubleshoot problems with the board when you are unable to download software to it. This Rube Goldberg machine uses various sensors in a chain of reactions that ultimately ends with a gumball rolling out of the Gumball machine. The only motion needed to start the machine is a clap from the hands. The processors used in this machine were all easy-to-use CCS E3mini boards that have a PIC® processor programmable from a USB port. In this video tutorial, we demonstrate how to use the CCSLOAD software with the ICD-U64 to program hex files to one or more PIC development boards! Update your stand-alone products in the field without the need of a PC! Learn from CCS development engineers how to quickly resolve programming issues! Eliminate a diagnostic serial port and save money by streaming data through the ICSP interface instead! Ejemplo de acceso a datos de depuración a través de la interfaz ISCP y el programador/depurador ICD-U64 de CCS. This presentation by Microchip introduces the CCS EZ Web Lynx network integration device.